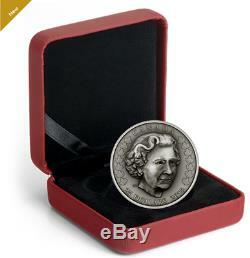 Pure Silver Coin - Her Majesty Queen Elizabeth II: Matriarch of the Royal Family - Mintage: 4,500 (2018) No. FINAL COIN IN THE SERIES! A repoussé-inspired coin enhanced with antique finish! A brand-new, unused, unopened, undamaged item in its original packaging (where packaging is applicable). A beautiful gift for royal watchers! 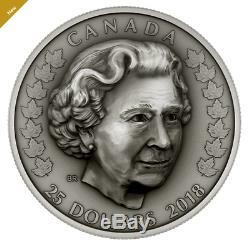 Her Majesty Queen Elizabeth II is the first monarch to be crowned Queen of Canada and it is our third time to portray her on a repoussé-inspired coin. She witnessed key turning points in world history, and shone as a luminary through periods of unprecedented change. Special antiquing heightens the historic essence of this coin, the final issue in this must-have subscription celebrating Canadas beloved monarch. THIRD COIN IN THE SERIES! Your coin is the third issued by the Royal Canadian Mint featuring The Queen as the matriarch of the Royal Familya highly collectible keepsake and the showpiece of this historic subscription celebrating The Queens life from princess, to young queen, to royal matriarch. A STUNNING BLEND OF TWO TECHNOLOGIESNING CENTURIES! Your coin is struck using the ancient repoussé styleenhanced with modern techniques. The deep indentations that would normally appear on a repoussé coin have been filled with silver to create a flawlessly smooth surface for the obverse; a stunning blend of two technologiesning centuries! AND ITS THE FINAL COIN IN THE 3-COIN SERIES! All three coins in this series use a three dimensional repoussé style providing a sculptural feel to the images. EXTRAORDINARY HIGH RELIEF OF HISTORIC REPOUSSÉ WITH ANTIQUE FINISH! Your coin features the extraordinary high relief of historic repoussé metal working techniques, combined with a special antique finish to create the allure of a 19th-century object of art to showcase this stunning, one-of-a-kind relief portrait of The Queen as the matriarch of the Royal Family a very special tribute to the enduring legacy of Queen Elizabeth II! The Royal Canadian Mint certifies all of its collector coins. Your coin is crafted from 33.56 grams (nominal weight) of 99.99% pure silver! Your coin is GST/HST exempt. The portrait, created by Canadian artist Bonnie Ross, depicts Elizabeth II at the age of her sapphire jubilee. The design echoes the style of The Queens effigies that have appeared on coinsthe face as the central element, shown from the neck up, facing right. The Queen is portrayed with a three-quarter view instead of the traditional side profile, and is flanked by two rows of maple leaves, alluding to her connection to Canada. Her gentle smile reveals the wisdom and experience that are uniquely hers as the longest reigning monarch in Canadian history. Her Majesty Queen Elizabeth II has reigned for more than 65 years, surpassing her great-great-grandmother Queen Victoria who reigned for 63 years, seven months and two days. She is also the first British monarch to reach the historic milestone of a sapphire jubilee, celebrated on February 6, 2017the 65th anniversary of her ascension to the throne. The Queens reign has been characterized by numerous firsts. Her coronation was the first to be televised. She has travelled more than any other monarch, and figured in many historic overseas visits. Her Majesty Queen Elizabeth II has arguably been the most visible monarch in history, and the most recognized and respected matriarch worldwide. Repoussé is an ancient metalworking technique in which the metal is pushed forward to create shapes, contours and sculpture that appear on the reverse side. Your coin is encapsulated and presented in a Royal Canadian Mint-branded maroon clamshell with a black beauty box. Mint price 149.95 CAD. Composition 99.99% pure silver. Artist Bonnie Ross (reverse), Susanna Blunt (obverse). 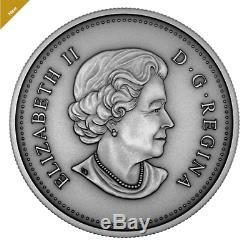 The item "Pure Silver Coin Her Majesty Queen Elizabeth II Matriarch of the Royal Family" is in sale since Thursday, November 8, 2018. This item is in the category "Monnaie\Pièces - Canada\Commémoratif". The seller is "alexsilvercoins" and is located in Verdun. This item can be shipped to Canada, all countries in Europe, all countries in continental Asia, United States, Mexico, Australia.